Find hotel near National Convention Centr .. 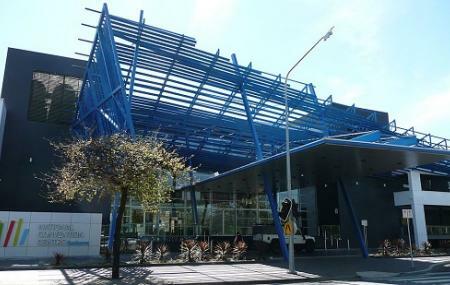 Opened in 1989, National Convention Centre Canberra is Canberra’s largest, purpose-built functions, meetings and events venue. It has a selection of 13 spaces over two floors, and the largest is the The Royal Theatre, which can accommodate up to 2,460 people. It is currently managed by the InterContinental Hotels Group. The Centre is a very eventful place, and several international artists have performed here. Visit the National Convention Center for a world-class experience. Want to plan a DIY trip? Use Canberra trip planner for the same. You can enjoy a comfortable stay in the city by booking the best hotels in Canberra like Forrest Hotel & Apartments, HamiltonÃ¢€™s Motel, Mercure Canberra and Peppers Gallery Hotel. Chalk out the best way to discover the city with Canberra vacation packages. Check out various modes for how to reach Canberra. Love this? Explore the entire list of places to visit in Canberra before you plan your trip. Fancy a good night's sleep after a tiring day? Check out where to stay in Canberra and book an accommodation of your choice. How popular is National Convention Centre Canberra? People normally club together National Film And Sound Archive and Australian War Memorial while planning their visit to National Convention Centre Canberra. It's a good facility for conferences. All of the breakout rooms were very accessible from different directions and chairs are reasonably comfortable. The staff that were there for the NMC2019 conference were very efficient and polite. The food was good...but the coffee was average. The fit out is getting a bit old though. Excellent facility, spacicious concourses for large crowds to move through the areas. Main theater area has excellent panoramic seating, audio has been spot on as has the lighting for every event I have attended, from graduation ceremonies, conferences and shows. The other meeting rooms are dull in decor and not sound proofed as well as one would like. Elevator capacity is low causing a "traffic jam" when catering for people requiring assisted accessibility. Location is good for walking to the nearby hotels and restaurants. Parking can be a little bit of a hassle however there is adequate room for dropoff and pickup. Wonderful place for concerts: The live music sounds so amazing and it adds to the experience. Wonderfully located and also has great dining options. Cocktails are tasty. Great place for a convention. Modern av facilities and convenient location. It's a convention centre, a largish open space that you can hire for events. Or, attend events. Really, there isn't much to say. Parking across the road, access from the front and rear.